In this video tutorial you will learn how to compose a scene using Clipartorama software. This video is provided as a .exe file, in order to see it, you have to download it to your computer and execute. This video is virus free don't worry to execute the file. Born in England, I developed a love for sewing at a very early age and recall using her mothers old Singer handle machine to make clothes for myself. Arriving in Sydney Australia at the age of 16, I was keen to start work so I could save part of my wages to purchase a sewing machine. “I was absolutely thrilled with my Bernina 740 machine and I still make good use of it today”. I was introduced to the world of computerised machine embroidery by a friend 10 years ago, which opened up a whole new and exciting pathway to explore. Although persuading my husband Greg that I needed an embroidery machine, software and computer was a different kind of challenge. After a shopping expedition a new computer, PE100 Embroidery machine and PE Design Version 1 were duly purchased. Running two websites, allows people access to information and helpful advice. I am a busy digitiser creating my own embroidery design collections as well as useful tutorials which are readily available on CD and download from my website. 10 years on I still find Machine Embroidery a great hobby and love catching up with people from all over the world. 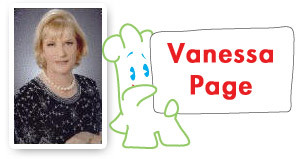 If you want to learn more about the great world of digitizing you can find many fantastic tutorials at Vanessa's websites.